Lunigiana owes its name to the town of Luni founded by the Romans in the 177 B.C. near the mouth of the river Magra. Today it identifies itself with the valley of the mentioned river and its affluents, while its historical border is more wide. Lunigiana is situated between Tuscany and Liguria, whose peculiar features it reproposes especially in the landscape , in the cultures, in the architecture and in the friendliness of its people. A small and homogeneous region, rich in history, lights, colours, prestigious images ,with green sceneries ending with the Apuan peaks and the wide meadow of the Appennino Everywhere is possible to find the signs of the Italian and European history: from the prehistory to the Middle Age , to the Modern Age. The area is characterized by a picturesque sequence of castles , Romanic churches, walled villages, noble an rural buildings which bear witness to the untouched cultural background. In every age in Val Di Magra , people and army contributed in the characterization of the structure of the settlements and of the defensive systems. Lunigiana is an ideal tourist place with its generally mild climate, relaxing environment, woody hills, full of fish rivers and modern facilities ( hotels, camping, tourist villages and farm holidays centres). Every commune of the area has got its own attractions: museums, thermal waters , sport facilities, big complex calcareous caves (Grotte di Equi) , ski resorts(Zum Zeri) and trekking centres. Moreover a real surprise are the folklore , the traditions, the gastronomy and the local handicrafts. A very good motorway and railways network but also a minor road network enable the tourists to reach the wide sceneries of the Appennino , the alpine refuges and the ancient small villages. 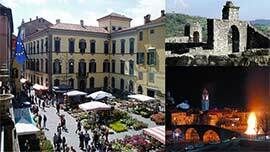 In short Lunigiana is a hospitable and full of resources land which can offer ideal stays and satisfy the peculiar interests and the tourists’ requests.